Leaders in Gulu district have in recent years used coercive means such as caning charcoal burners for plundering forests in the district. At various points in recent history, the Chairman of Gulu district Martin Ojara Mapenduzi has managed to trap charcoal burners and whipped them. Last year, Ojara mounted an operation in which he caught and caned burners, most of whom had invaded Gulu from Luwero that has almost been depleted of forest cover. Now, Mapenduzi and other leaders from Gulu want to use more persuasive means of fighting deforestation by mobilising local people to plant trees. Working with local NGOs, the district leadership recently launched a fundraising run to raise money as well as create awareness among community members to plant trees. Bernard Loum, the Head of programs at CEED Uganda told the media recently that the marathon will be an annual event to highlight the benefits to the environment to the people. CEED plans to raise over 30,000 tree seedlings with the support of the National Forest Authority and other partners. Loum says they plan to plant the trees along roadsides, at schools among other public institutions and lands not only to conserve the environment but also to beautify the district. “We realized last year that the efforts of the district chairman in fighting indiscriminate tree cutting needed joint efforts. So we decided to partner with other organizations and institutions to plant more trees. People do not want to realize that the extreme weather conditions that we are now experiencing are a result of negative human activities on the environment,” said Loum. Lt. Hassan Kato, the UPDF 4th Division Spokesperson pledged to work with the community in planting more trees and conserving the environment. “If you look back to last year around March when we suffered a serious water crisis, as the UPDF, we are committed to partner in conserving the environment. That is why when you go to all these army facilities, the barracks and brigades, they are always green,” remarked Kato. CEED picked a component of tree planting last year because of the need within the district as part of the efforts to combat the negative efforts of climate change that is embedded in Sustainable Development Goal number 13 that puts emphasis on combat climate change. 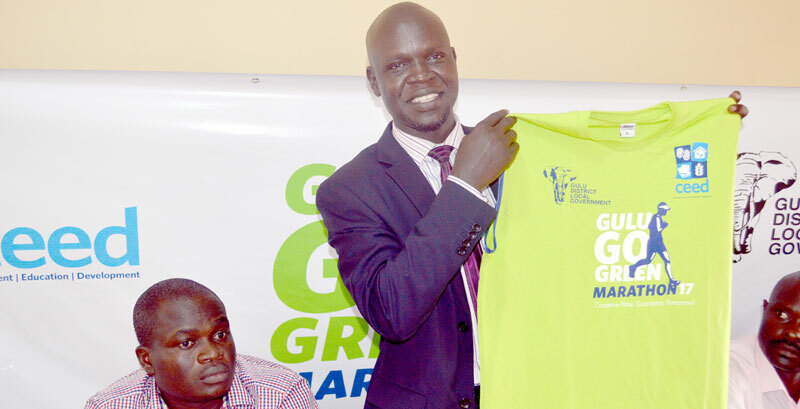 Mapenduzi, the fficially endorsed the launch of preparatory activities towards the Gulu Go Green Marathon and urged members of the public to take part in conserving their environment so that the district ceases to witness extreme weather conditions. The chairman called for collective efforts to re-foretaste areas that have been deforested. Mapenduzi’s suggestion to cut some of the ‘old’ trees in the municipality and have them replaced with young ones may bring him in conflict with environmentalists, who consider such old trees as invaluable carbon sinks that cannot be removed before young ones are up. Mapenduzi however observed that much as beautiful roads are being constructed within the district, they would look better with trees lining them at both sides just like the British did in the municipality during their era in the town. Moses Abonga, the Chairman LCIII of Laroo division in Gulu told The Sunrise the division has already drawn plans to plant trees along the roads both old and new roads.